Oregon basketball is relevant again. Not super-relevant, but SportsCenter-highlight-package-during-the-NFL-Playoffs-relevant. And that’s a huge step in the right direction. Oregon knocked off No. 4 Arizona last night, 70-66, handing the Wildcats their first loss. 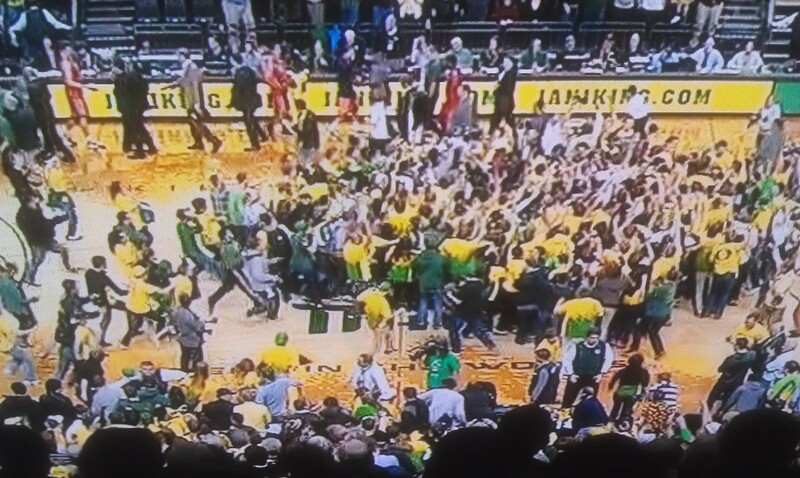 While it was only a four-point win, it was essentially an Oregon blowout bookended by awful Duck basketball. After enduring an 0-11 start, Oregon outscored Arizona 41-19 throughout the rest of the first half. And despite letting the Wildcats claw their way back into the contest in the waning moments, E.J. Singler came through when he needed to, made his free throws and iced the game. Its undoubtedly the Ducks biggest win on their home floor since Matt Knight Arena opened last season, and, according to head coach Dana Altman, the biggest in his tenure. Oregon now has the third best overall record in the Pac-12 (13-2) and remains unbeaten in conference play. Bill Walton has no clue that Dominic Artis and Jonathan Loyd are different people. Seriously. The High King of Hyperbole managed to attribute an entire three-minute stretch of amazing guard play in the first half to Artis, only Artis was on the bench for half of it. Every single time he mentioned his name in the latter part of the first half, it was in reference to poor Loyd, who happened to have his best game since Nov. of 2011. And then, in an irony of ironies, the post-game interview that Walton conducted with a standout Oregon performer was held with none other than Mr. Jonathan Loyd. Also, Walton really likes the Grateful Dead, attributes the origins of flopping in the NBA to the Oregon teams of the ’70s and pronounces the name “Waverly Austin” more beautifully than any human being could. Ever. As the Ducks’ backcourt goes, so do the Ducks. After a season of abysmal three-point shooting, Oregon picked a fantastic time to shoot twice their season average. They shot 7 of 11 from behind the three-point line, with Artis draining three of his four attempts. If he’s pulling up confidently, he spreads the floor in a way that the other four guys out there can’t. And Loyd managed to make just 12 minutes of floor time seem like 20 by being so damn perky. E.J. Singler has decided to be real thing in 2013. After disappearing for the opening half of the season, Singler put on a show last night, scoring 14, dishing out seven assists, grabbing seven rebounds and notching three steals. Welcome back, Mr. Singler. Oregon is really long. Between Waverly Austin, Tony Woods and Stretch Armstro… er… Arik Armstead, Oregon has three big-time athletic, long big men roaming around the low post. Case in point: Last night, as Arizona’s star point guard, Mark Lyons, attempted to take the game over in the second half, Austin and Woods closed down the lane on him, forcing Arizona to play an inside-out game. On two separate occasions, Lyons had beaten his on-ball defender (Artis once, Loyd once), proceeded unabated to the rim, then got rejected by a very large, very long arm attached to a torso shrouded in the neon-est of neon yellows. Not everything is well. Arsalan Kazemi wasn’t as active down the stretch as Altman undoubtedly hoped for, and the Ducks late near-collapse wasn’t easy on the heart. Tony Woods, normally a lights-out shooter inside five feet, was missing open shots, Singler, on his best night, still shot below 50 percent, and Artis showed an odd reluctance to take the offense over in the second half. Dana Altman still really looks like James Cromwell. I’m sure there are plenty of other comparisons that would ramp up the flattery, but you can’t fight facts.